This device captures 50 pages of your handwriting or drawings - using normal ink - and it transfers them to your computer as a digital document. 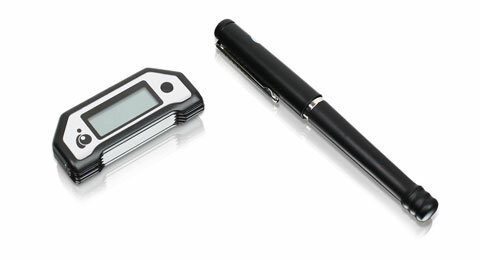 You can sign checks with this thing, but it has enough digital juice to grab a whole day's worth of meeting notes. When you're done jotting, upload to any computer you want - without need of a digital notepad or special paper. The handwriting recognition software (OCR software) converts your notes into digital text. This has a real benefit for anyone giving a presentation, because you can connect the pen to a digital projector to show your writing in near real time. Forget overhead projectors. Pretty cheap too. You can buy it for $129 from the manufacturer or pick it up for less than $100 online.